WASHINGTON, DC -- The Pentagon is delaying a training program for Ukrainian soldiers so as to avoid giving the Kremlin an excuse to scrap the tenuous peace deal struck last month between Kiev and Moscow-backed separatists, a top U.S. general said Tuesday. 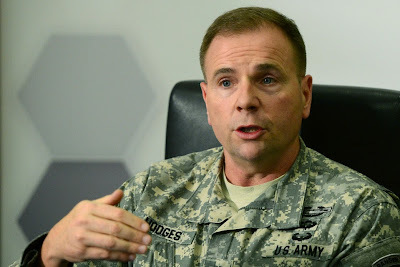 General Ben Hodges said at a breakfast Tuesday that the U.S. wanted to make sure the training didn’t interfere with the Minsk-2 peace deal. The general’s comments, at a breakfast with reporters in Washington, reflect a dilemma the West has faced in dealing with Russia’s yearlong push into Ukraine: how to force President Vladimir Putin to back down without provoking him to escalate the fight instead. Worried that any overt military assistance to Ukraine’s embattled armed forces would push Moscow to retaliate, the White House has repeatedly overruled some senior officials at the State and Defense Departments, and refused Kiev’s requests for lethal aid, such as antitank weapons. The training delay appears to continue the U.S. policy of caution in dealing with a nuclear-armed Russia that has so far defied Western economic sanctions in its support of east Ukraine separatists. Last month, after a bloody attack to grab more land from Kiev, the rebels agreed to a new peace deal. An earlier deal, negotiated in Minsk, Belarus in the fall, had collapsed quickly. Now Washington and the European Union are watching whether the so-called Minsk-2 truce will prove any more durable than its predecessor. “The administration is being very cautious; they don’t want to upset the Minsk-2 apple cart,” said Steven Pifer, a former ambassador to Ukraine now with the Brookings Institution. The training of Ukrainian National Guard battalions was supposed to take place in western Ukraine, far from the front lines of the conflict. The Ukrainian units were supposed to be matched up with U.S. Army battalions and instructed in how to improve battlefield first-aid, how to combat enemy radio jamming, and how to survive heavy artillery fire, among other areas. “The start of the training was delayed to try and provide some more space to see that the ceasefire and the full Minsk agreement could be successfully implemented,” Gen. Hodges said Tuesday during the breakfast with reporters. He said he expected the training would begin later in the spring. The alleged presence of Western mercenaries among Ukrainian armed forces has been a frequent—and unsubstantiated—plotline of Russian propaganda since the war in Ukraine began. Speaking about the Ukrainian army in January, President Vladimir Putin said, “This is not even an army, it’s a foreign legion. In this case, it’s a foreign NATO legion,” he said, referring to the multinational North Atlantic Treaty Organization. At the same time, the Kremlin has denied widespread reports of Russian soldiers and Russian military gear being used in east Ukraine. Gen. Hodges also lashed out at Putin for his recent televised revelation that he had put Russia’s nuclear forces on alert during the annexation of Crimea last year. “There are people who are very concerned about us doing things that might provoke the Russians. They clearly need no provocation when you look at what they are doing,” Gen. Hodges said. The White House may still be white but, decisions it makes on dealing with Russian are not so.